These have been my go-to black liners for many months now, actually, I'd say this whole entire year. Each of them are used almost everyday, however, perform different roles for my overall look. I don't use pencil eyeliners for my eyes ever. Having to sharpen them, making sure there isn't any wood debris, and risking any wood flakes getting into the eye is just an inconvenience for me. BUT, I did buy this due to a friend's recommendation. She uses it on her lids for an everyday look by quickly running a lighter across it. Without doing it this way, she says the pencil is way too harsh to drag across the lids, and totally useless. Her results are a nice, rich, smoldering look. I use mine, however, to lightly shade in the eyebrows. Works great for me as the color matches perfectly, and makes blending really easy. 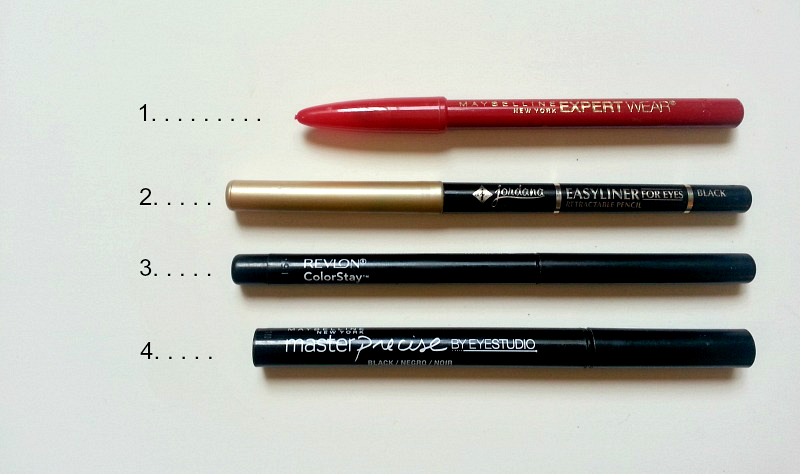 With this liner being creamy, it applies smoothly and practically glides on. However, it does crease, and smudges on the top and bottom lash lines. So, I only use this eyeliner when I'm going for the smokey eye look. It's perfect for that, and works well with a rubber tip. 3. Revlon Colorstay (retractable pencil)- Used for an everyday look on top/ bottom/ tight line. For the longest time, I was on the hunt for the "perfect" eyeliner. I stuck to gel for the longest, but still wanted to revert back to pencil for that less harsh look. Then I came across this, my favorite all-around eyeliner (for now.) It stays in place, doesn't fade, and there is absolutely no smudging at all. I'd say this is probably one of the best drug store eyeliners out there. I mentioned this pencil a while back here. The thin felt tip is really flexible and makes it easy for winging or outlining the eyes. I like that I can control the strokes and the thickness of the application.The formula comes out matte, is fast drying, and stays on all day. All the more reasons to love it. 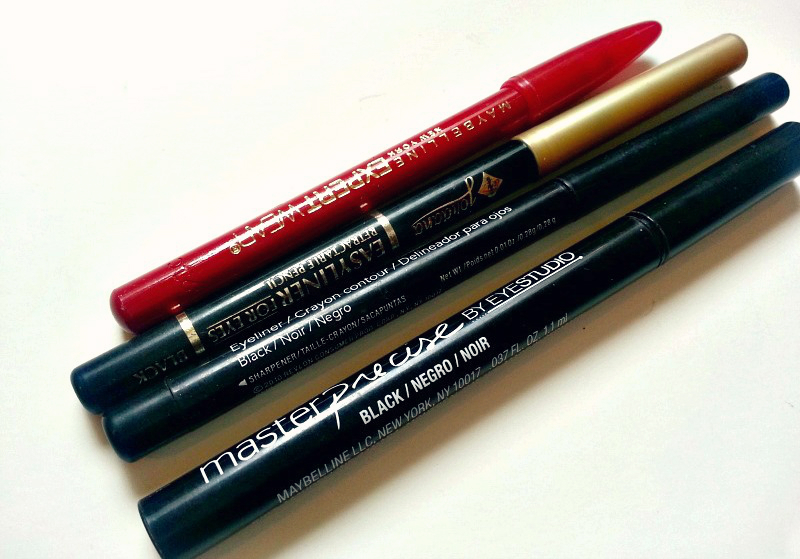 I'd love to know, what are your favorite eyeliners? And do you prefer pencil, gel, or liquid? I'm a pencil girl. My favourite pencil is between the Urban Decay Glide-on Pencil and the Clarins Waterproof pencils. I love love love liquid pens!! I've always been wondering about Master Precise liner, seems like I need to try it myself heheh. The liquid pens are great nice post! Wow! i wish I am good at doing my eye make-up! I'm a gel eyeliner kinda girl. Kind of stuck on the mac fluidline, but I am on the hunt for something a bit more subtle and every day, and this post has helped me remind me of that! Thanks for the pro-tips. Hey this is nice information. Thanks for following my blog babe. Laura Mercier has a semi-cream eyeliner and it is UH-MAZING! It's a little pricey, but definitely worth it! This past year I've been using ELF liquid and I actually love it. It costs a dollar and works pretty good. However Im always looking for other things so I might give the 4th one a try! I like that you can control the strokes and thickness which is very useful. Great review! Here's to 2013! Hi lovely! Thanks for dropping by my blog! Nice blog here, now following :) Happy new years! I prefer to use pencil for my lower lid and liquid for the top lid. @pinsneedlesfashion- Yeah, I tried the ELF liquid one, too. But it dried out rather quickly and the felt pen was kinda scratchy on my lid. :( I wish it would have worked out though, especially considering the great cheap price!